I’m starting with vegetables because I have found them the easiest to prepare. 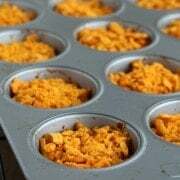 I could write a separate post for each vegetable that I have made into baby food, but I want to keep things simple and also don’t want baby food to take over my blog. If you want specific details on each food, I’ll again direct you to Wholesomebabyfood.com. That website has instructions for both simple preparation of each food as well as recipes for mixing each food with other ingredients. It also instructs you on when to start that food, how that food freezes, and describes the nutritional make-up of that specific ingredient. Can you tell that I love the site? It is my #1 go-to resource for baby food preparation. I know I’ve already mentioned the pros and cons of baby food making and how it isn’t for everyone, but if you were a drooling 6 month old baby, which would you rather eat? The picture quality is far from my best, but I’d rather eat the stuff on the left. A carrot comparison would have been even more impressive but I didn’t have any jarred carrots in my pantry. I’ll be honest though, I’ve feed my little girl both homemade and store-bought green peas. And she gobbled them both up at the same pace. 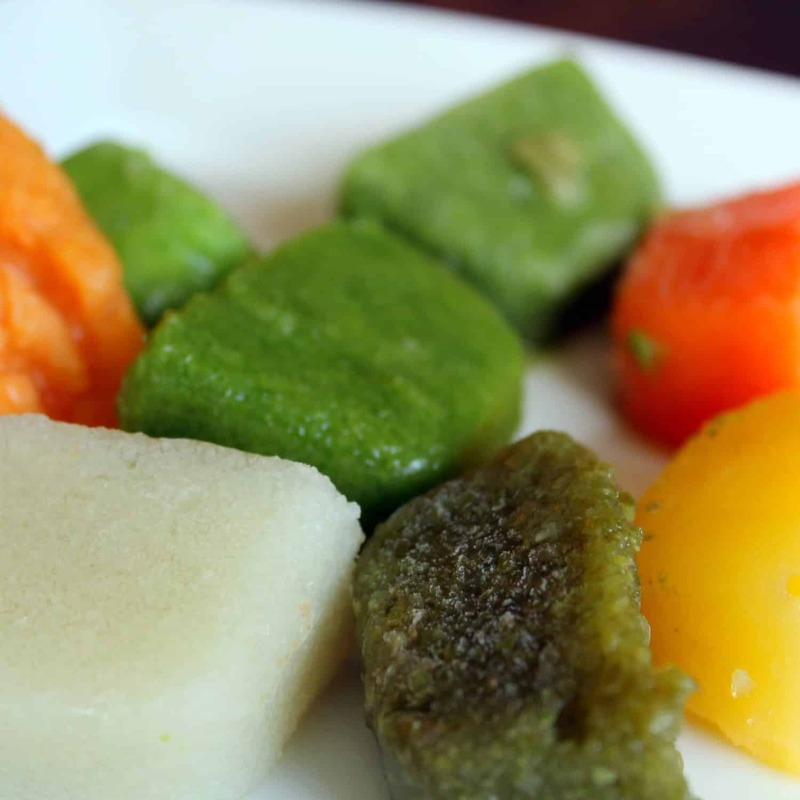 This post will cover the preparation of the green peas pictured above, as well as parsnips, carrots, green beans, sweet potatoes (do they count as a veggie? ), acorn squash, cauliflower, broccoli, and asparagus. What to know how to prepare a vegetable not mentioned here? Shoot me an email and I will either do a post on it or reply to your email with instructions. I’d like to mention again that I am far from being an expert in this area. I am teaching myself and learning as I go. I do take some shortcuts (frozen veggies), just as I do in all my other cooking and baking. See that awesome food processor? I won that on Bunkycooks food blog. Great blog, great food processor! I never win anything! I’m still giddy about it. And here is an example of the frozen vegetables (cauliflower, green beans) right before I popped them out of the trays. The icy formation on top is normal and is a result of steam. I usually turn the trays upside down, pop the cubes out onto the foil and then use the foil to help me get the cubes of food into the bags. If you’re wondering why there is a cube of green beans missing, it was because I was hungry and couldn’t resist eating it. Totally kidding! Just wasn’t enough purée to fill all the spaces. Alright, let’s get started. This might be is a little repetitive, so I apologize in advance. 4. Place carrots in steamer basket over saucepan filled with ~1 inch of water over medium-high to high heat and steam about 15 minutes or until fork tender (fork tender = poke fork into vegetable and it comes right back out). 5. Puree, adding enough of the steaming liquid to come to a good consistency. I like to err on the thick side because I can always thin it with water, breast milk, or formula. If it is a first food, purée until very smooth. If your baby is a little older, you can leave a little more texture in the carrot purée. 3. Roughly chop parsnips . Discard thickest part of parsnip if it seems woody. 4. Place chopped parsnips in steamer basket over saucepan filled with ~1 inch of water over medium-high to high heat and steam about 15 minutes or until fork tender (fork tender = poke fork into vegetable and it comes right back out). 5. Puree, adding enough of the steaming liquid to come to a good consistency. I like to err on the thick side because I can always thin it with water, breast milk, or formula. If it is a first food, purée until very smooth. If your baby is a little older, you can leave a little more texture in the parsnip purée. 1. Place green peas in steamer basket over saucepan filled with ~1 inch of water over medium-high to high heat and steam about 10 minutes or until tender, but still beautiful bright green! 2. Puree, adding enough of the steaming liquid to come to a good consistency. I like to err on the thick side because I can always thin it with water, breast milk, or formula. If it is a first food, purée until very smooth. If your baby is a little older, you can leave a little more texture in the pea purée. 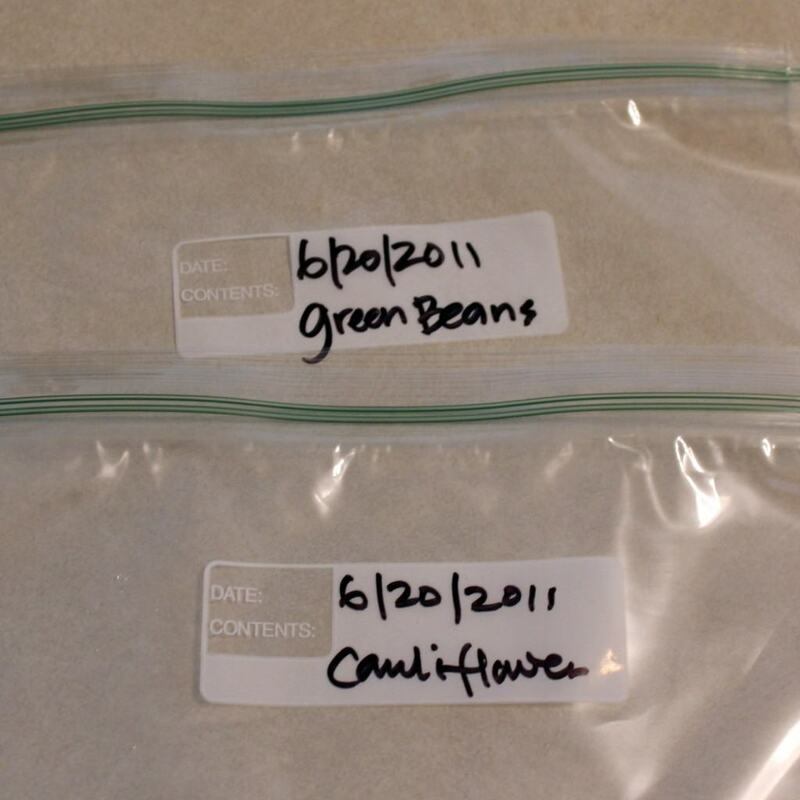 1 bag natural frozen green beans (should fill about one ice-cube tray). Feel free to use fresh if they are in season (if using fresh, snip of tough ends and wash prior to following steps below). 1. Place green beans in steamer basket over saucepan filled with ~1 inch of water over medium-high to high heat and steam for about 10-15 minutes or until tender. 2. Puree, adding enough of the steaming liquid to come to a good consistency. I like to err on the thick side because I can always thin it with water, breast milk, or formula. If it is a first food, purée until very smooth. 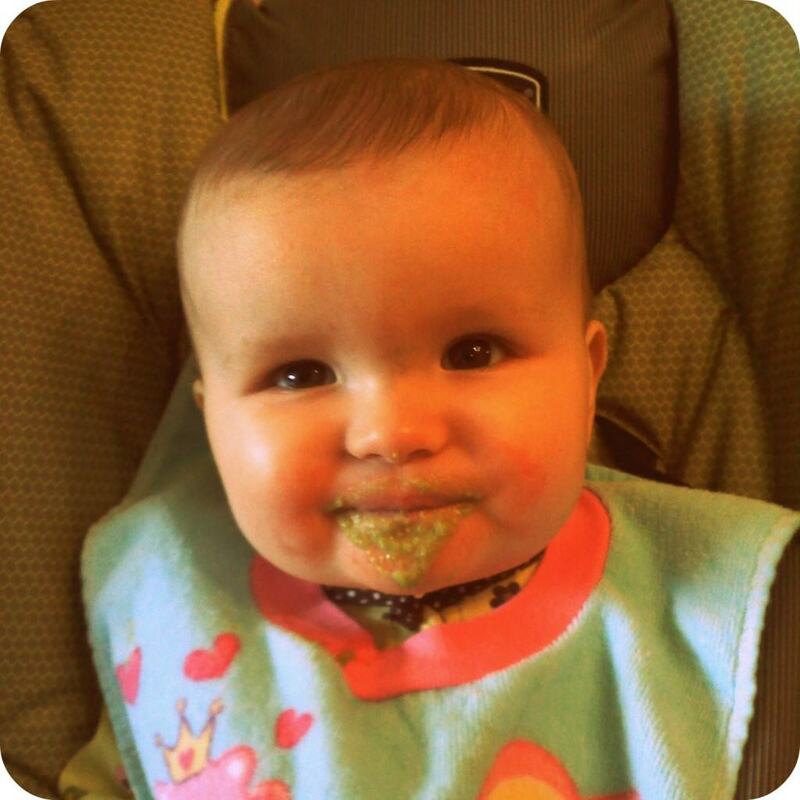 If your baby is a little older, you can leave a little more texture in the green bean purée. 4. Place chopped sweet potato in steamer basket over saucepan filled with ~1 inch of water over medium-high to high heat and steam about 15 minutes or until fork tender (fork tender = poke fork into vegetable and it comes right back out). You can also bake sweet potatoes as you normally would if you were cooking them for yourself. 5. If this is a first food for your baby, I would recommend running it through a food mill to get a very smooth texture. Sweet potatoes tend to be a little chunky and stringy. The second time I made sweet potatoes, I just used a potato masher, but they do remain a bit chunky with that technique. 1. Peel with vegetable peeler or knife. 4. Place chopped squash in steamer basket over saucepan filled with ~1 inch of water over medium-high to high heat and steam about 15 minutes or until fork tender (fork tender = poke fork into vegetable and it comes right back out). You can also bake acorn squash as you normally would if you were cooking it for yourself. 2. Puree, adding enough of the steaming liquid to come to a good consistency. I like to err on the thick side because I can always thin it with water, breast milk, or formula. If it is a first food, purée until very smooth. If your baby is a little older, you can leave a little more texture in the squash purée. 5. Use same technique for different types of squash. 2. Roughly chop flower portion. Cut away tough outside of stem, and roughly chop. 3. Place chopped broccoli in steamer basket over saucepan filled with ~1 inch of water over medium-high to high heat and steam about 10-15 minutes or until fork tender (fork tender = poke fork into vegetable and it comes right back out), but still a beautiful bright green! 4. Puree, adding enough of the steaming liquid to come to a good consistency. I like to err on the thick side because I can always thin it with water, breast milk, or formula. Broccoli should not be a first food. Wholesomebabyfood.com recommends introduction of broccoli between 8-10 months of age. 1. Wash (skip if using frozen). 2. Roughly chop flower portion. Cut away tough outside of stem, and roughly chop (skip if using frozen). 3. Place chopped cauliflower in steamer basket over saucepan filled with ~1 inch of water over medium-high to high heat and steam about 10-15 minutes or until fork tender (fork tender = poke fork into vegetable and it comes right back out). 4. Puree, adding enough of the steaming liquid to come to a good consistency. I like to err on the thick side because I can always thin it with water, breast milk, or formula. Cauliflower should not be a first food. Wholesomebabyfood.com recommends introduction of cauliflower between 8-10 months of age. 3. Place chopped asparagus in steamer basket over saucepan filled with ~1 inch of water over medium-high to high heat and steam about 10 minutes or until fork tender (fork tender = poke fork into vegetable and it comes right back out). 4. Puree, adding enough of the steaming liquid to come to a good consistency. I like to err on the thick side because I can always thin it with water, breast milk, or formula. Asparagus should not be a first food. Wholesomebabyfood.com recommends introduction of asparagus between 8-10 months of age. Parsnips not pictured, they haven’t been looking great at the store so I haven’t bought any. Which is too bad, my daughter loves them! 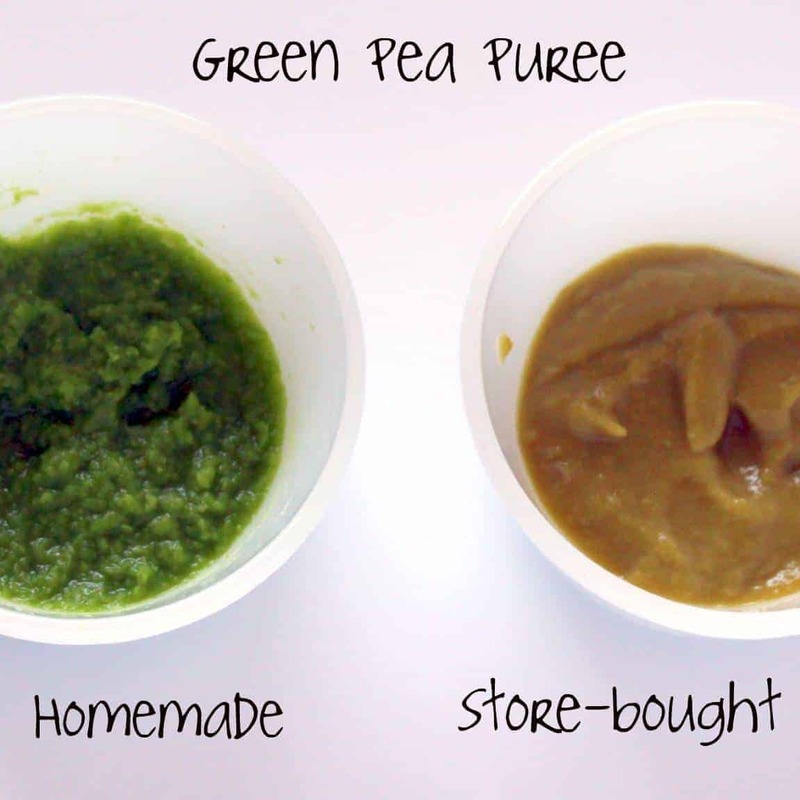 I took my best guess with the green purees–should have labeled the picture immediately after taking it…. 1. Try roasting your vegetables instead of steaming to introduce some flavor variety. 2. 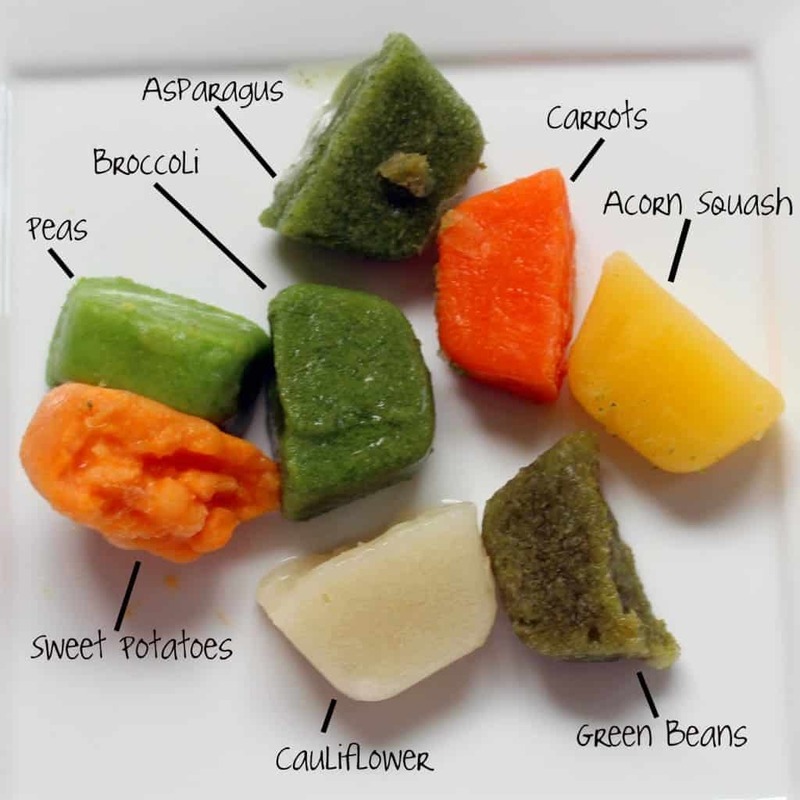 As your baby gets older and you have more foods introduced, you may want to decrease the amount of food you purée so you don’t have so much in your freezer. 3. I would recommend trying to use frozen baby food purée within 6 weeks (I’ve seen all different recommendations–this is an average). 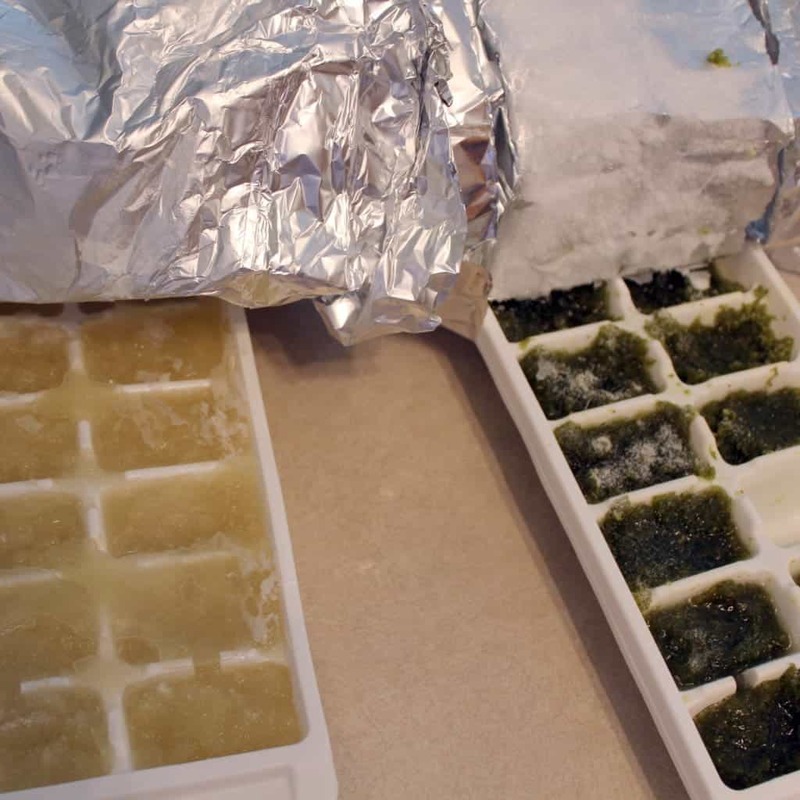 If you have a deep freezer, you can probably stretch it and keep it for 3 months or more. 4. I reheat for 45 seconds to a minute in the microwave at full power, and then allow to cool before serving to my baby. Deb at Smitten Kitchen thaws her baby food overnight in her fridge. Figure out what works best for you! Anyone still here? 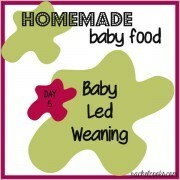 Sorry, I know that was terribly repetitive, but I hope it will be a good reference for beginning baby food makers. I also feel like there is so much that I did not cover. Again, please comment, email, or ask me on Facebook or Twitter if you have a question. 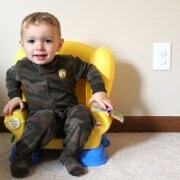 Making baby foods is really fun and especially when seeing my baby eats them deliciously. Thank you for sharing! Three years later and I’m glad I found this. Our LO will be 6 months old this weekend and we’re starting him on solids! We have the baby bullet all ready but I have not figured out how I will steam the veggies just yet. I will be making all of his baby food and I’m looking forward to seeing more of your recipes. 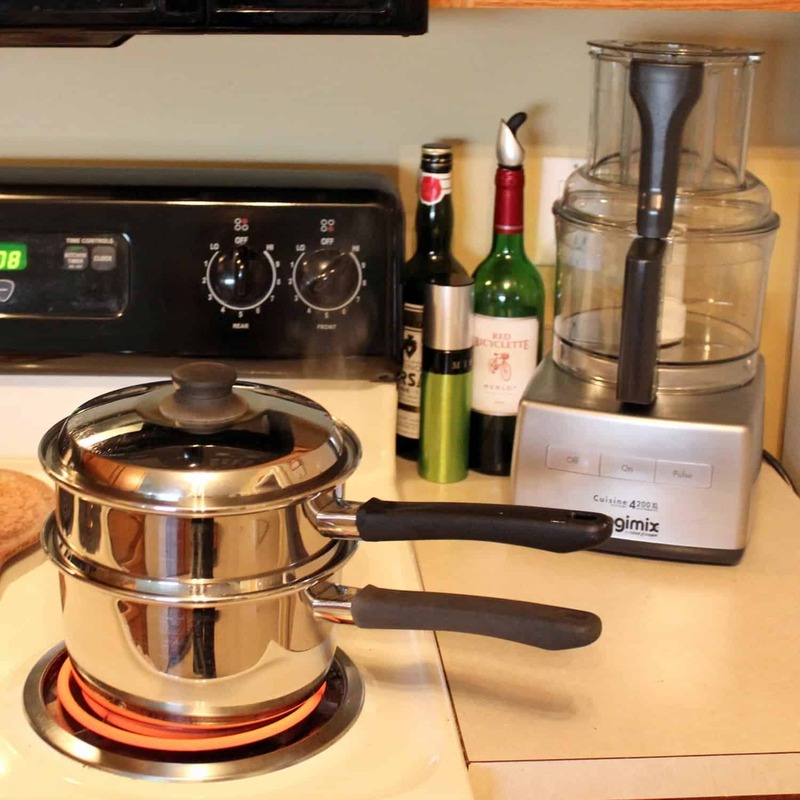 Great preparation tips – I had not considered preparing broccoli before now. Thanks for posting this, especially the homemade vs. store-bought photo. Ugh! A question: When I last tried to make peas the shells were terrible. I used a bag of frozen standard peas and the shells were sticking all over the place, especially the roof of my baby’s mouth. Did you have that problem or is my puree thingy not doing it’s job? Hmm, it was a little more textural than the canned as you can probably tell from the pictures, but I’m pretty sure the shells broke down. I’d say puree it for longer, or add a little more water. If that doesn’t work, try a food mill or pressing it through a fine mesh strainer if you want a really fine puree. Wow, what a compliment! Thank you, glad I could help! How old is your baby? I’m not pregnant yet, but making my own baby food is something I very much look forward to. I am bookmarking your tutorial so I can come back when it’s time to get to work! When I’m blessed with a baby, I plan to make all the food myself. Great post! Thanks! I hope to have a few more of these posts coming. Loved these tips! Plus the link to the blog that you really like–I’ll have to check it out. Makes it sound simple, which I’m excited about (even though my still-in-the-womb baby won’t be eating solids for awhile!). I do not make a lot of baby food but I still find your posts really helpful. If I ever have a baby I definitely think I will be making my own food. That comparison between fresh and canned really sold me. I’ll have to remember all of this if I have a baby someday. You really know your stuff! I have no kids but I think these posts you are doing are vital and a fantastic idea!